April is National Poetry Month. Anyone doing something special? If not, why not? I am writing poetry, of course. Hopefully every day, but let’s be realistic. I’ll also have some special posts that coordinate with Upper Rubber Boot’s month-long Couplets: a multi-author poetry blog tour. Please visit their site for updates throughout the month of April. You can also follow it on Facebook, Twitter and Goodreads. If you’re looking for simple ways to celebrate here are a few from the Poets.org site. If you have your own, I’d love to hear about it. Select a poem you love, carry it with you and share it. Put a poem on the pavement in chalk. This entry was posted in Interesting Blogs, Poetry, Senryu, Tanka, Uncategorized and tagged April, Couplet, Couplets, Facebook, Goodreads, National Poetry Month, Poem, Poetry, postaweek2012, Senryu, Twitter, Upper Rubber Boot. Bookmark the permalink. aloha Yousei Hime – there is a tree here called a Signature Tree. the leaves are thick and stiff and a dark semigloss green, they range from an inch square (a miniature tree) to a couple of flat hands in size (full grown large tree). a scratch in this leaf produces a very white (to white-yellow) line. so it’s easy to write your name on the leaf. or anything else. the leaves are renewable – in fact if you pick one, the tree produces more clusters. these leaves can be dried – or press dried so they are flat (tucked in thick old telephone books will work reasonably well). then they become beautiful shades of tea and coffee browns. the lines when dried however may or may not stand out as well as when they are green (i’ve never quite figured out how to ensure the contrast). so.. one of the things i like to do is yes, write poems on a leaf now and then. sometimes i save them. sometimes i simply write it (and may be draw on it too) and let it go, to tumble around along the ground and maybe find a place with someone who discovers it. I like this comment so much, do you mind if I put it into a post of its own? You really are going to get me to visit Hawaii, just to gather some of these wonderful leaves. aloha Yousei Hime – sure, it’s fine to launch a post off of this comment. or “put it into a post of it’s own” – however you’d like to do that. i know i’ve posted images of these leaves in some places, i’m not sure if i have on my WP Blog. when i have some time i can see if i can find some of them. or i probably have images of some on my computer – now that i think about it. would you like me to look?? they are not recent, so i’d dig back a couple of years – which is not a problem. i think i’ve said this at other times: some people really like hawaii (i happen to be one of those people). some people really do not like hawaii. there seems to be very little middle ground. like most things if there are high expectations, it’s easy to be disappointed. if there are low expectations or no expectations, then it’s easier to find delight. ….gathering a few of these leaves would be easy enough. you have to write/scratch on them within about a day of picking (oh, i’m not sure you could take them back to the mainland tho???). i used to collect one or two on the way to work in the morning, wrap them in a paper towel and slip them into a plastic bag (there is some milky sap where they are picked and from the scratchings) and then draw on them at lunch time. that was about the right timing as i remember it. Thank you. I’ve got the post ready to go (just waiting and hoping for your ok). Come have a look and let me know if I should add/delete anything. I found one image that worked, but I’m not sure if its of the exact plant you mention. I’ll keep looking. Thank you so much for sharing this with me (and now others). aloha Yousei Hime – i’m not sure exactly where to look. i found some leaves i experimented on in 2007 (images of the leaves i mean – altho i still have some dried leaves too). i could send you a couple of those images in gmail if that would help. i can also take a photo of leaves on one of my miniature signature trees if that would help. i would have to do both of these a little later tho. ha. life. again. fun. aloha. Any and all of those you are willing to do would be great. I can always add them to the post. I really love the idea. Imagine a whole tree with poems on its leaves. 🙂 Poem tree. bwahahahaha – yeah. a poem tree. now i can imagine climbing that tree – way fun. i could spend hours… heck, maybe days in that tree. no spaces all lowercase and of course the dots and symbols in appropriate places. that’s where i’ll email from later if that is okay with you. aloha. I’m feeling a great need for some Yousei haiku. 😉 And I’m in need of writing something good. I’ll get on it, my less-than-subtle-but-oh-so-adorable muse. I totally want to find the perfect poem to carry in my pocket! I am not fond of prompts, I can’t possibly tell you why. I suspect that it is because I prefer, especially with haiku to simply be inspired. So … that said this month’s NaHaiWriMo prompts are simply “kigo” words. Now that I can do! So I shall attempt to post there daily I think (shaw says being one day late already. I wrote the poem but never published to NaHaiWriMo. OK, OK, I was in the harder all day. 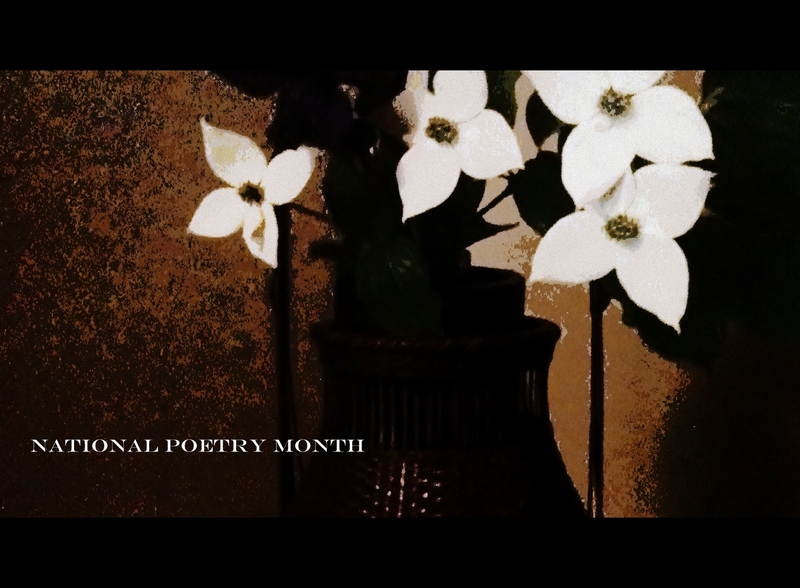 happy poetry month…i did poem a day last year with a small group of poets…it really did produce some of my best stuff…still debating on whether i will do it this year…we’ll see…smiles…. I’m pretty much on my own unless I do something like that online. All the writers in my group are essayists or novelists. Lonely poet that I am. Best wishes to you this month no matter what you’re doing. I look forward to reading it. Happy Poetry month to you all! And while not chalk on pavement, I did make an origami crane with one of my poems written on it and left it in the park. I don’t know what happened to it, but I’m happy I did it. Hi Yousei, I am joining in on the madness as well. I will check-out the site, there is also “napowrimo” the site offers prompts each day. Please go read a post I have up about my Spanish speakers ( 6th graders) writing poetry in English. I think you will get a kick out of it. Hi Yousei, Happy Poetry Month to you! I’m enjoying reading many posts today. Always enjoy visiting here.